This month has brought visitors from England and with them an excuse to revisit and marvel at the beauty of nearby Florence. Whist the crowds head to the viewing area at Piazzale Michelangelo to take in the city’s skyline, we escaped the chaos and sought refuge in one of my favourite spots in the city. 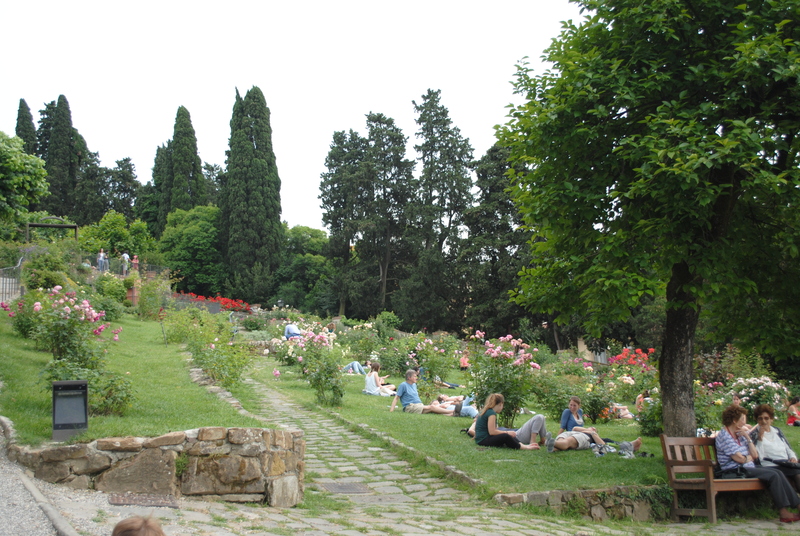 Perched on the hillside above Florence, directly under the Piazzale, Il Giardino delle Rose is an oasis of calm with spectacular views of the city. 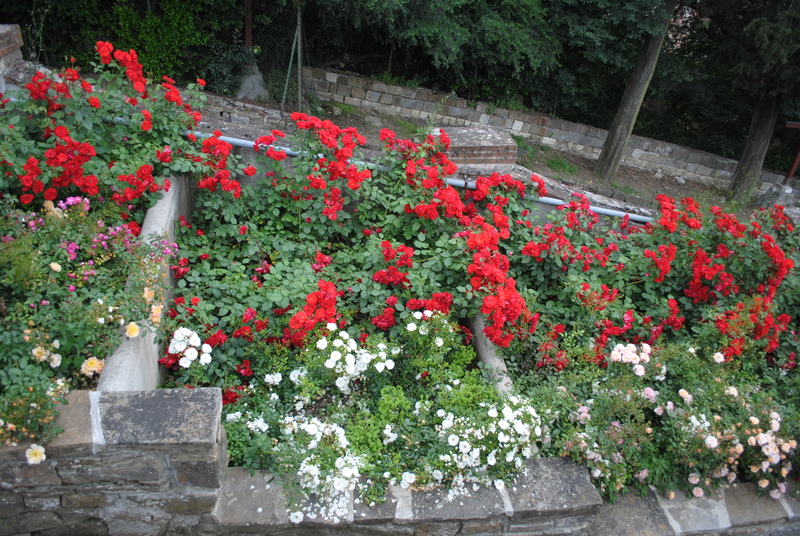 The walled, terraced rose garden was designed by Giuseppe Poggi in 1865 and restored a couple of years ago. The garden contains a number of types of plants (1000 botanical varieties) including lemon trees, waterlilies and a recently added Japanese garden. 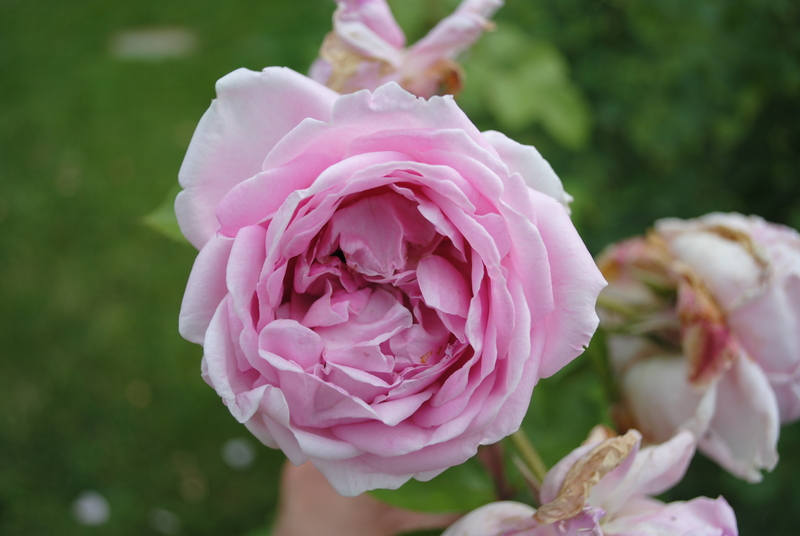 The main attraction, however, are undoubtedly the 350 varieties of (mainly old) roses. 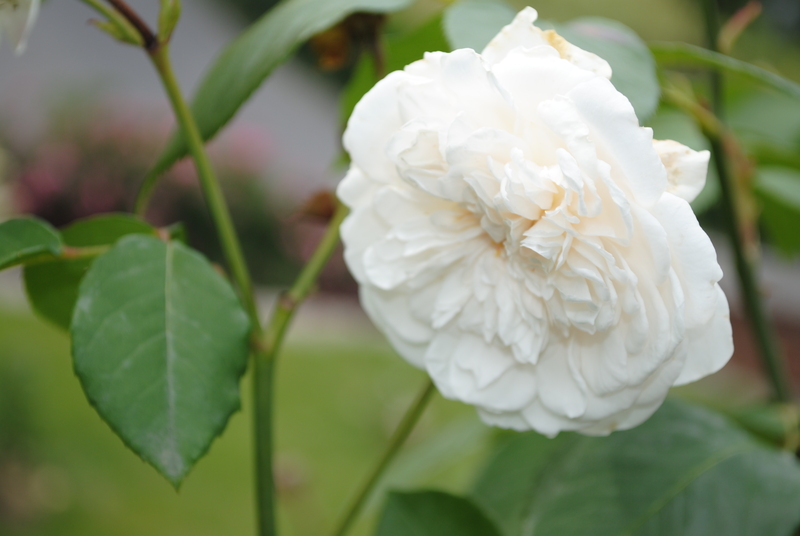 When in bloom, the array of climbers, ramblers, shrub roses and more fill the garden with a heavenly fragrance. The garden is free to visit and has a pleasingly relaxed atmosphere, with Florentines and tourists alike sprawled on the grass sunbathing, reading and picnicking. 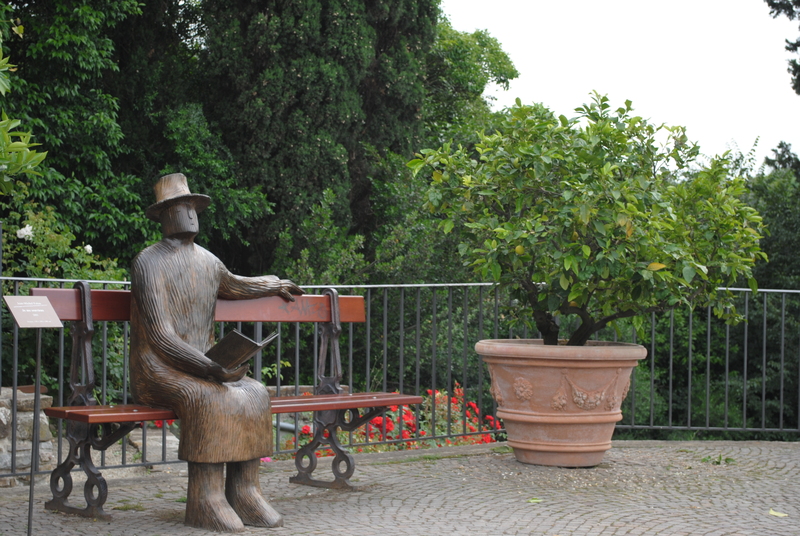 Since 2011 the garden has hosted a permanent exhibition of gently-surrealist statues by the Belgian artist Jean-Michel Folon, who fell in love with Florence as a young man and whose widow bestowed a collection of bronzes on the city on his death. Since the installation of the Folon statues, the rose garden is open year-round from 9am to dusk. By our visit in the second week of June some of the rose blooms had faded, and swollen hips were already forming on some of the bushes – in May the garden would be absolutely spectacular, and a visit could be combined with a visit to the garden’s sister space, the nearby Giardino dell’Iris, which opens for one month a year. 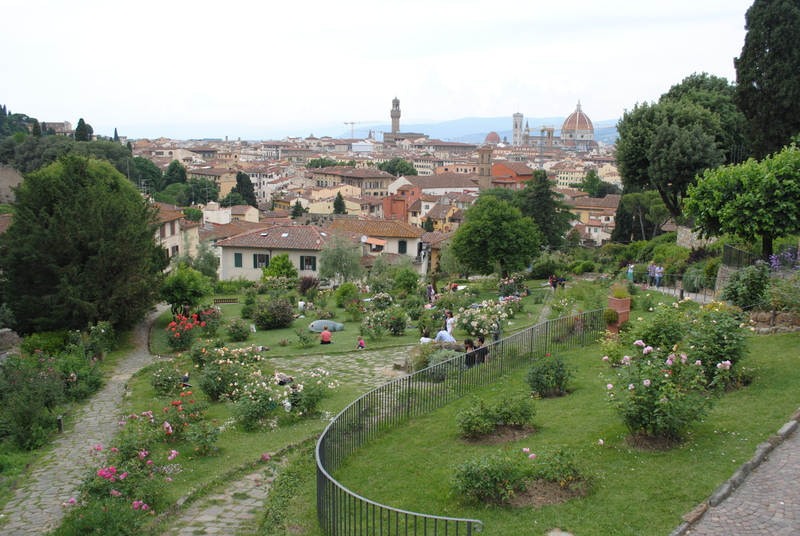 Regardless of the season, however, the rose garden must be one of the most peaceful and relaxing places in Florence, with views which are only rivalled by those from Piazzale Michelangelo and San Miniato, both of which are just above the rose garden. 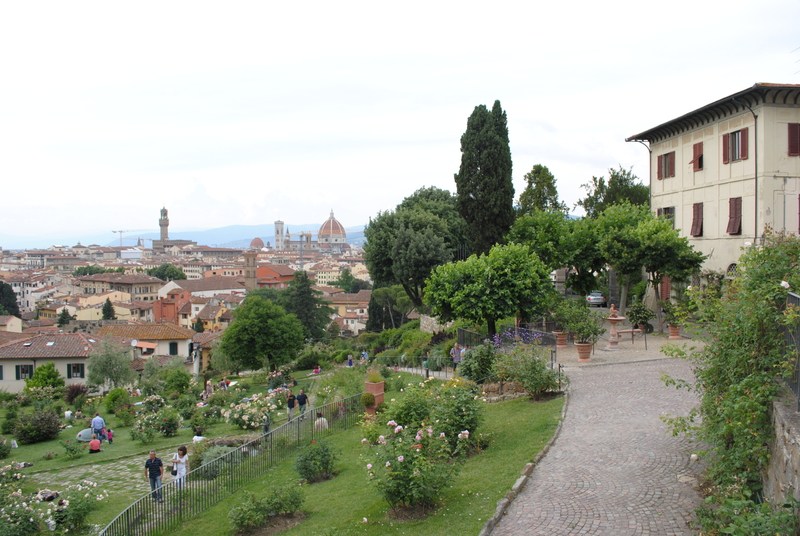 The steep climb to the garden is well worth it, and can be eased (or rewarded on the way down) with a visit to a bar or gelataria in the relaxed Oltrarno neighbourhood. I never knew it existed, your photos capture it beautifully….I’ll visit next June! It’s lovely, and May-June are definitely the best times to visit. I hope you have another opportunity, it’s a wonderful city. 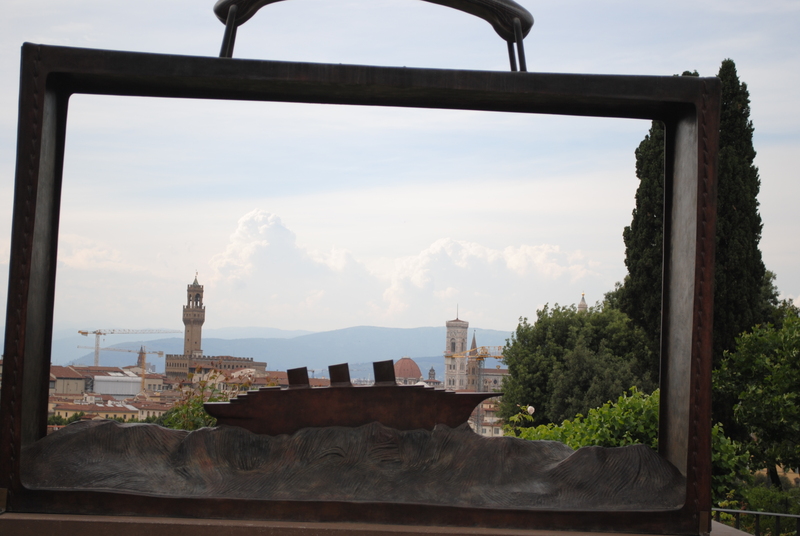 On a garden club tour several years ago, I fell in love with Tuscany…of course! So sorry I missed this lovely spot. With the help of your post/photos and my imagination, I placed myself in this garden this AM while on a ‘time out’ from shelving garden books in a new home. Thank you for the lovely visit! 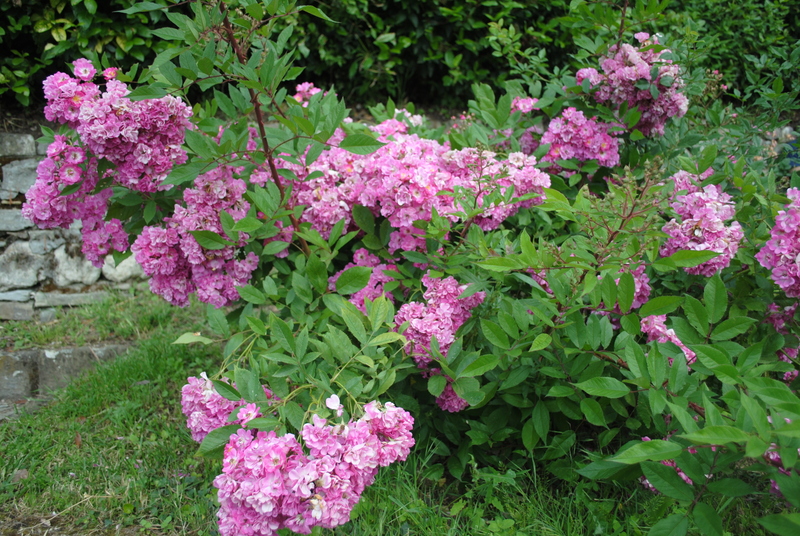 Tuscany has many beautiful gardens, most of which I’m yet to explore, and in May-June there are roses everywhere, it’s heavenly. This garden used to be closed most of the time, only opening in May, so it’s not surprising you missed it. I’m glad you enjoyed ‘visiting’ it today! Looks just wonderful. I have never been to Italy, but would love to some day. My older son went with a friend before starting University – they were in Rome (where his friend has an aunt), Florence, Sienna, and Venice. The crowds do sound intimidating, though. It’s a fascinating and beautiful country, absolutely worth the visit if you ever have the opportunity. The big cities are certainly crowded with tourists but there are plenty of peaceful spots, such as this garden, too. Lovely post. I like that it’s not overly manicured and that people are actually using the space rather than just looking at it. 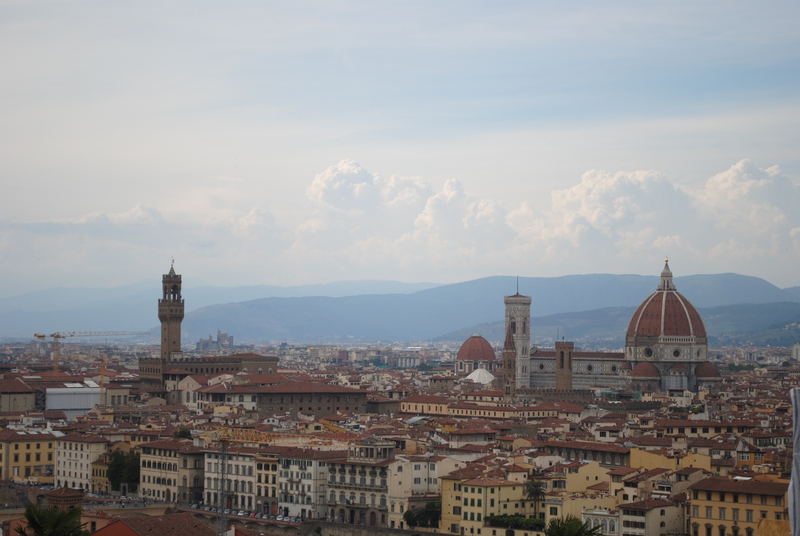 I’ve never been to Florence, which is clearly a BIG oversight! I agree, I hate gardens where you can’t walk on the grass or approach the flowers for a closer look/sniff. Florence is a beautiful city, definitely worth visiting! Definitely worth a look, it’s such a peaceful spot. I plan to visit next May so I can see the iris garden in flower too. Like many of your other commenters I haven’t visited Florence yet, but would love to do so, especially as your post describes the rose garden so well. And irises too in May.